The Macross sure remembers love. Do you? It was actually this anime I wanted to see first, but I felt I had to check out the original Super Dimension Fortress Macross to get some necessary background. After seeing what turned out to be one of the best series I have seen in recent memory, I thirsted for some more Macross and decided to come back to Macross Plus. Macross Plus (マクロス∙プラス, makurosu purasu) was actually a 4-part OVA, but I checked out the movie, which compiled the four parts while adding scenes the director felt missing in the OVA. It is the year 2040, and the 30th anniversary of the end of the war between UN Spacy and Zentraedi forces approaches. Myung Fang Lone produces the wildly successful AI singer Sharon Apple. She runs into her two childhood friends-turned-test pilots, human Isamu and Zentraedi Guld. Unfortunately, bad blood exists between the two men as they vie both for control of the aircraft they test as well as for Myung’s affections. Like in the original, the first thing that stands out in Macross Plus is the animation. Unlike the original however, Macross Plus featured absolutely gorgeous visuals. While it was an OVA that came out more than a decade after the original series, Macross Plus pioneered the integration of computer graphics with traditional cel animation. On top of that, Macross Plus was co-directed by Watanabe Shinichiro, who is most well known for having helmed Cowboy Bebop. What resulted were some absolutely thrilling flying sequences. Additional future Bebop talent to work on Macross Plus was composer Kanno Yoko. Sharon Apple’s (as well as Myung’s) singing was central to the plot of Macross Plus, and the tunes Kanno crafted were everything you would expect from her. What really stuck out in the soundtrack was the song “VOICES”, performed by Arai Akino. While Macross was a wartime series, Macross Plus took place in peacetime. Thus, the OVA was entirely focused on the relationship between Myung, Isamu, and Guld. Overall, the drama was well-made but I personally didn’t think the love triangle was as interesting as the one between Hikaru, Misa, and Minmei in the original series. I think it could have been because of the OVA’s length, which simply wouldn’t have allowed for as much build-up as a 36-episode-long series. That said, the fates of our three leads were quite predictable. It did take a long time for the characters to gain likability, but thankfully they did at a comfortable pace when their backgrounds were revealed. 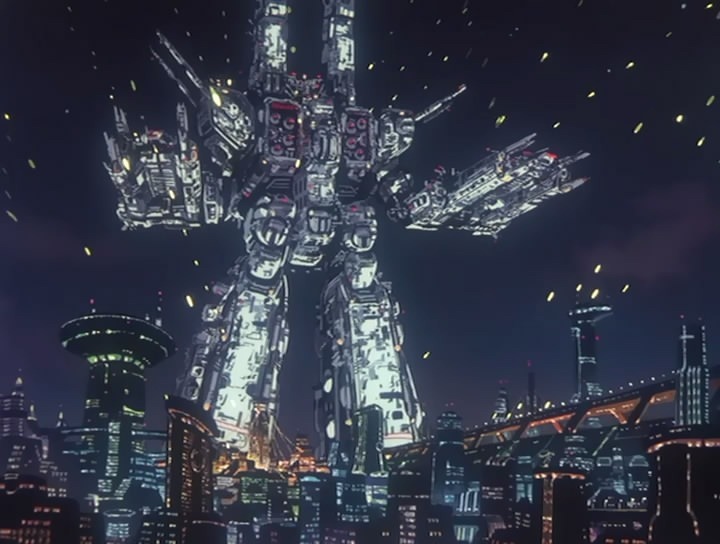 While the plot is largely independent of the original series, I think people who have seen Macross will get a lot more out of Macross Plus’ story, namely with references to Guld’s Zentraedi roots and the history of the titular Super Dimension Fortress and why it was sitting in a pool of water at the center of Macross City. It was also neat how a reference to Minmei’s “My Boyfriend is a Pilot” was worked in. While I liked it, I am not sure how someone who has not seen the original series would feel about Macross Plus and its references to past events. On its own right, Macross Plus was an excellent OVA with a fast-paced story, tip-top animation, and a gorgeous soundtrack to boot. I will admit that I probably am unfairly comparing it to the original series when I say I don’t feel Macross Plus had quite the timeless story that made Macross such a classic. Nonetheless, it is definitely a worthy successor and in general an example of some of the best anime to have come out of the 90s.